Welcome back to the ‘Cosplay Spotlight‘. It’s been a while since our last article, but we’re hoping it can once again become a regular feature on the Doctor Who Cosplay website! If you would like to take part in a future edition of the Cosplay Spotlight the details of how to do so are at the end of this article. The Tenth Doctor is my favourite Doctor in the series history. His cheekiness, compassion, humour, intelligence, intensity and heroism was superbly played by David Tennant. The costume worn by Tennant emcompasses everything about the character, while showing a level of geek-chic that fans can embrace and replicate with general ease…. 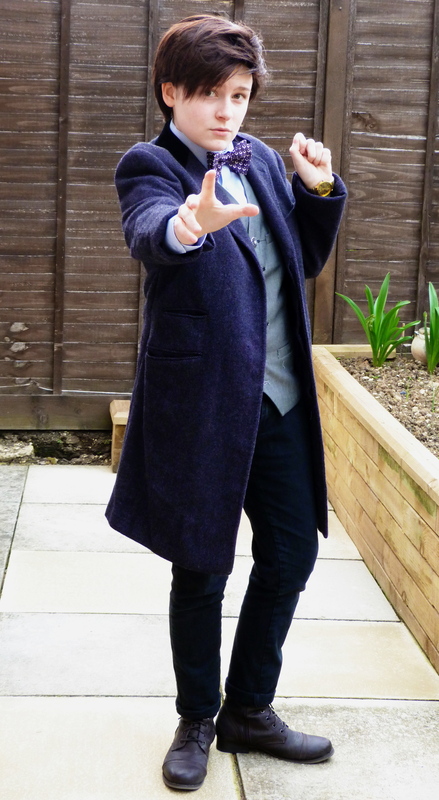 Cosplaying as The Doctor gives me the confidence to be happy in myself, that I can be “cool”. This was my first proper serious attempt at cosplay back in 2007, and nearly 7 years later I’m still attending conventions when I can, meeting the show’s stars, and receiving great feedback from everyone I meet. I’ve also made loads of good friends through wearing the costume, whether it be fellow cosplayers or fans of the show. Recently I’ve been inspired by other well known cosplayers to have a go at prop building, sourcing the parts, researching techniques and constructing as close a replica as possible has really given me a great amount of satisfaction, that I’ve actually created something. Cosplay has become my life over the past few years, and I honestly don’t know where I’d be without it. Doctor Who has also been a huge part of my life since 2005, so last year I thought; “Well, why not combine the two?!”. My Doctor is the Eleventh (of course) and ever since I started cosplaying I knew I wanted to do an Eleven costume at some point. So here I am, one year on, with a bunch of Eleven’s costume variants hanging in my wardrobe! I’m immensely proud of my little collection, and it’s expanding all the time. I love Matt’s Doctor because he’s goofy and funny and marvellous and loving and intimidating and dangerous all at the same time. He’s the oldest Doctor, and the most damaged, but he puts on a smile anyway. He gives me hope that everything is going to be okay, in the end. It’s funny, I can’t really explain why I love him so much. I just do. It’s one of those things, you know? After a friend recommended that I start watching a show called “Doctor Who” I decided to try it out. Two weeks later, I finished binge-watching my way through all of the New Who, completing my transformation into a rabid Whovian. After that, I started looking into cosplaying. I have found that it is a great way to express my creativity, as well as my love of characters from my favorite movies, television shows and games. It’s incredibly fulfilling to meet people who recognize the character or who are cosplaying another from the same work. I chose to portray River Song because she is one of my favorite characters from Doctor Who. She is an enigmatic, complex character who takes care of business but who isn’t afraid to have a bit of fun while she’s at it. I encountered cosplayers at my first con back in 2005. It looked like a lot of fun and I’m a creative person by nature so it was only a short matter of time before I started making my own cosplays. I re-discovered Doctor Who at one con a few years back (I used to watch Classic Who when it was on the ABC) and loved it even more. So I started cosplaying a number of Who characters starting with my favourite River Song, then the Tardis, 11th Doctor and as a Human Dalek. As part of the 50th Anniversary last year, I also started up a group called Whovian Cosplayers of Oz, where any and all Australian Who cosplayers can get together for photo meets and help each other with their cosplays. At our first meet, I had only expected ten people, so I was a bit bewildered to see about forty turn up! 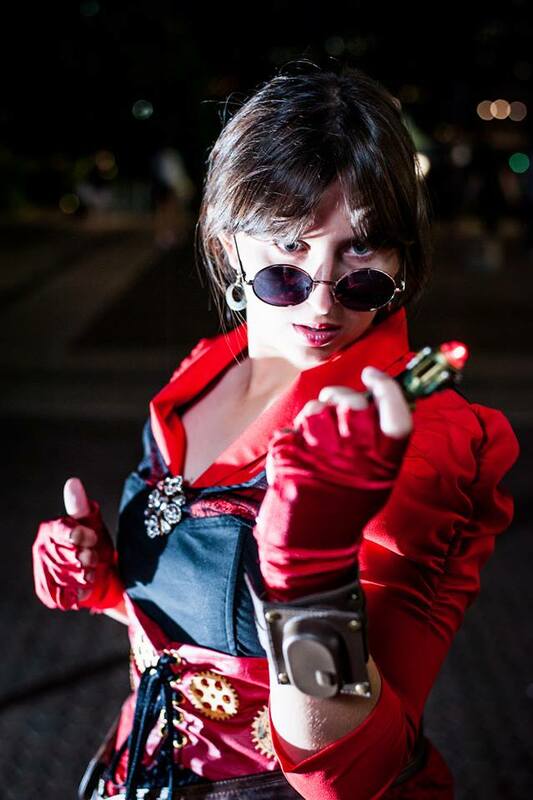 My latest cosplay for our next meet is the Steampunk Timelady (or Female Timelord). I had seen other cool Steampunk Doctor Who creations like Steampunk Tardises and Daleks, it just seemed logical to have a Timelord steampunked. My design was inspired by the Gallifreyan costumes in Day of the Doctor. She’s a Timelady in a Steampunk Doctor Who universe fighting in the Steampunk version of the Time War. We don’t see much of the Time War currently, but to me, there must be at least some interesting stories and characters that could come out of it and that was part of the motivation for the Timelady. To start weaving a Steampunk Time War story. The day I finished the cosplay I was lucky enough to be part of a photo shoot that night and my Timelady got some great photos. I’m currently planning a Steampunk version of the Rassilon staff to go with the cosplay for a future meet at Brisbane Supanova. At first i didnt really like Amy, since when David Tennant left I cried so much that I just didnt want to watch Matt Smith but this, of course, changed over time and it didnt take me long to adore the Eleventh Doctor and his adventures with the Ponds. It all started 3 years when I was trying to convince my friends to watch Doctor Who with me, my best friend, Lara, noticed i looked a bit like Amy. Now, back then I didn’t have black hair, nor I was ginger, I was blonde. Despite this you could see the resemblance in even our expressions and attitude. Amy has grown throughout her time on Doctor Who, and so have I with her. The actress Karen Gillan is a lot older than me, but when I was 15 I looked and in some way acted how Amy did in season 5. Before starting cosplaying as Amy I had done the Eleventh Doctor and the Tenth. 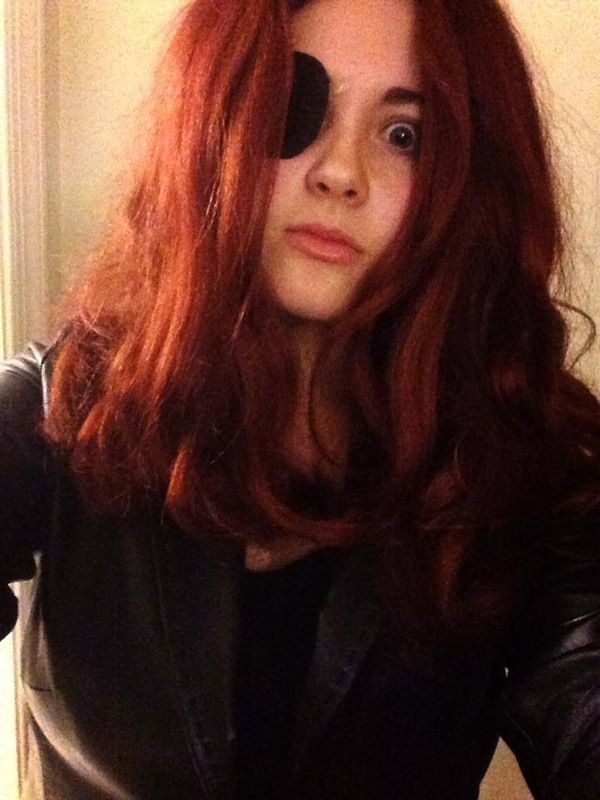 But being a girl it did really work out, so I started cosplaying Amy in 2013. When I cosplay as her I try the accent, and it’s fun for me getting into the character. The Whovian world is amazing, all the people I’ve had the chance to get to know thanks to the show, and with the internet and sharing my pictures and seeing their cosplayers, it is just amazing how cosplaying gets people together! Top Image: River Song by Wibbly Wobbly Cosplaying.